Despite losing his sight in an accident at age two, John Stanley (1712-1786) was equally successful as a violinist, a conductor and a teacher. Reportedly he could conduct a work from memory after just one hearing. In the course of his lifetime he composed songs, ballads, concertos, cantatas, oratorios and stage works. Stanley’s six Concertos span the years 1740 to 1775, and reflect the stylistic development that Stanley, a contemporary of Handel, Bach and Mozart, experienced. Franz Lehrndorfer worked on Stanley’s Concertos Op. 10 from 1997 to 2000, on the basis of a facsimile edition published by Oxford University Press. They were scored for ‘two violins and a bass’ (cello and double bass), omitting any wind instruments, and even the viola. The solo instrument, which according to the title, can be ‘Organ, Harpsichord or Forte Piano’, is therefore especially important. It is an interesting challenge to translate a fairly thin, three-part score on to the organ, both respecting the original composition and utilizing the possibilities of the organ, as the same notes can have varying effects on different instruments. A further peculiarity of these Concertos is the omission, in four of them, of a slow movement, which the performer was expected to insert according to the circumstances. Lehrndorfer opted to complete the four Concertos by inserting some of Stanley’s Voluntaries. The Concertos are played on the magnificent organ of the Munich Frauenkirche. It offers a multitude of tonal possibilites, of which only a small part are suitable when performing Stanley. The recording therefore only uses the main organ and only a small part of the possible registrations. 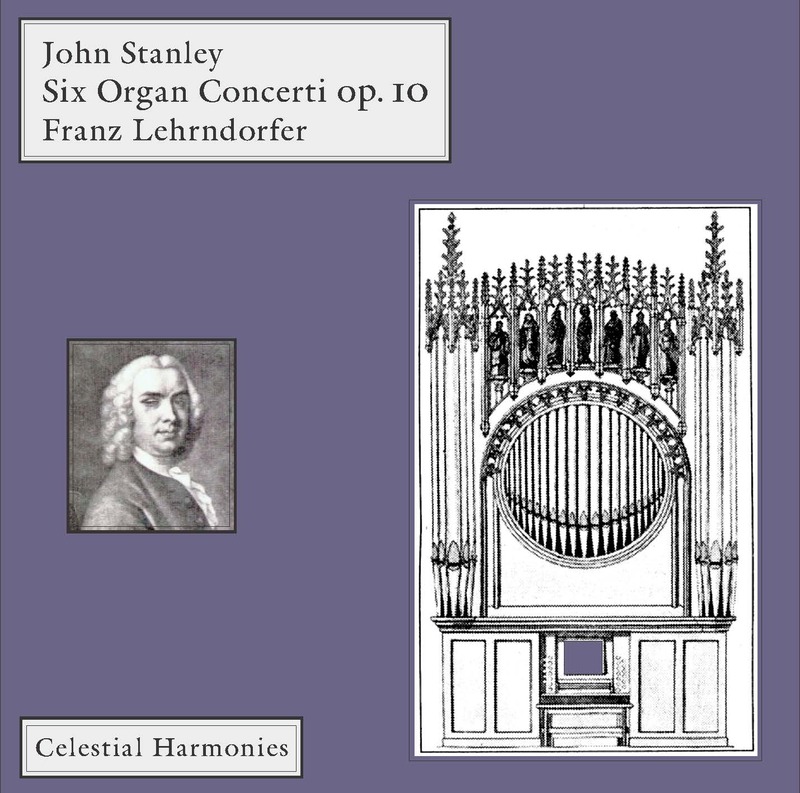 In summary, this recording can be described as a deeply personal, but nevertheless authentic interpretation of Stanley’s Organ Concertos, that would have surely received the acclaim of the composer. Franz Lehrndorfer was born in 1928 in Salzburg, Austria, of German parents. He grew up in Kempten, Bavaria and received his early musical education from his father, a choir conductor and musicologist. He begun his professional life in 1951 as an educator with the German boys choir Regensburger Domspatzen, where he met his future producer/engineer Ulrich Kraus, who was one of the choir’s singers. Their friendship and collaboration has thus endured half a century. In 1957, he proved his mastery of the organ when he won first prize at the international ARD Competition sponsored by the German broadcasting network. In 1969 Lehrndorfer was appointed organist of the Munich Cathedral, the same year he became head of the Department of Organ and Catholic Liturgical Music at the Munich Conservatory. His renown and the resulting demand for his services as a teacher led him to found a School of Organ in Munich, which has since produced two generations of graduates. More than a few names well–known to the music world may be counted among them. Passing way in 2013, Lehrndorfer had carried on a tradition of organ recitals initiated by his predecessors and had expanded their scope. Well–known contemporary composers wrote works for him to premiere. In Celestial Harmonies’ efforts to present Lehrndorfer’s definitive catalogue, we also include a survey of the instruments he has played over his illustrious career. The new organ in the Dome at Munich is also featured on Celestial Christmas 5 (13090), The Concert (13109) and Theme & Variations, Vol. 2 (13209), the organ in the Pfarrkirche, St. Quirin, Tegernsee and the Dome at Eichstätt on Bach Reger (14200), the organ of St. Boniface in Munich on Romantic Organ Music of the 19th Century (13213), and the concert organ of the Academy of Music in Munich on Theme & Variations, Vol 1: Improvisations On Children's Songs (13208). Concerto No. 1 E Major 12'43"
Concerto No. 2 D Major 15'32"
Concerto No. 3 B Flat Major 13'49"
Concerto No. 4 C Minor 12'33"
Concerto No. 5 A Major 8'43"
Concerto No. 6 C Major 11'33"